Take a look at these 5 romantic places, from Natural Parks, to breathtaking viewpoints that boast stunning scenic views and monuments of great beauty. On the Malaga coast you will find los Baños del Carmen, named after an old spa built in 1918. From there you can enjoy one of the best sunsets in the Costa del Sol. It is a magical and popular destination, chosen by many couples for their wedding photoshoot. In a small cove hidden by the grove you will find el Balneario, a restaurant where you can also enjoy a variety of concerts and interesting cultural activities. 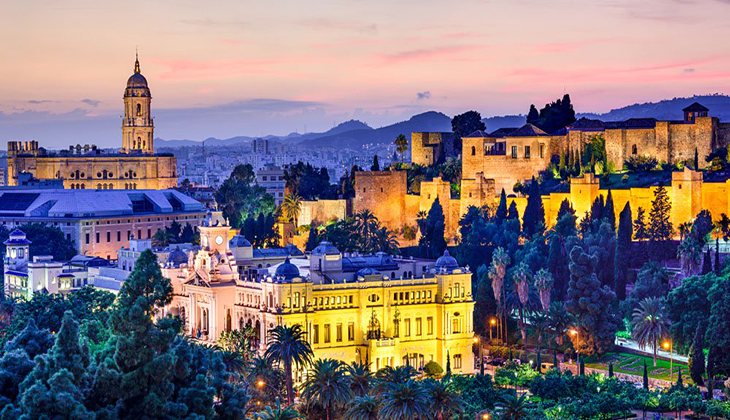 The Gibralfaro viewpoint is one of the most romantic places in the city of Malaga. From the top of its mountains you will enjoy a splendid view of Malaga and its spectacular coastline. The viewpoint is located by the Gibralfaro Castle, a fourteenth century fortress built to defend the Alcazaba. Don't forget to stop at the Hotel Parador Malaga Gibralfaro, an outstanding hotel with an exquisite restaurant and terrace, from which you can enjoy magnificent sunsets overlooking the sea. Frigiliana is considered to be one of the most beautiful white villages in the whole of Malaga. Located in the Axarquia, characterised by its Moorish architecture, its beautiful and narrow streets are perfectly preserved, forming an urban framework of little whitewashed houses decorated with flowers. Frigiliana is in the heart of the Almijara, Tejeda and Alhama Natural Park, making it an exceptional natural environment, ideal for those seeking outdoors adventures where you can enjoy a variety of sports, from hiking and horse-riding to caving. It is no exaggeration to say that Ronda is one of the most romantic places in the world, and there is no easier way to prove this than by starting your visit at the Puente Nuevo (new bridge) over the Tajo de Ronda river, the most iconic landscape of the city. It is located in the heart of the city and its height goes up to a staggering 100 meters. To marvel at all of its beauty, the best option is to gaze upon it at the Plaza de España viewpoint or the Ernest Hemingway street, situated in the new part of Ronda, just at the entrance of the city. And if you want to learn more about it, we recommend visiting the interpretation centre. In Ojén, surrounded by a lush pine forest in the heart of Sierra Blanca, you will find this magnificent viewpoint, with a wondrous scenery of the blue sea and the mountains. It can be reached by car on the A355 road, following the signs to ‘el Refugio de Juanar’. Once you have parked there, you can continue by foot and cross the chestnut forest and the wild olive trees, until you reach this spectacular viewpoint from a simple and accessible pathway.